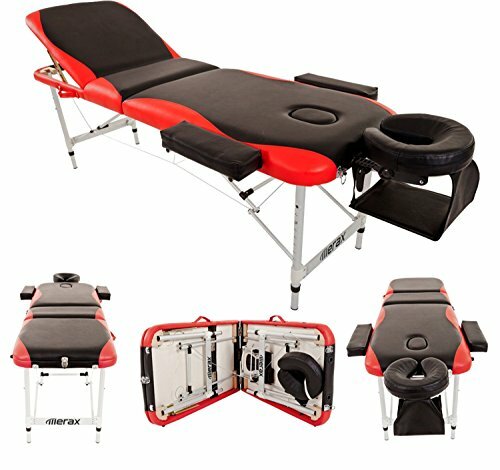 The Merax Deluxe Portable Massage Table has many great features: High quality, Light weight, Portable and Durable. This table is expertly crafted with a sturdy aluminium frame and features 2 inches of high density foam for a comfortable massage experience. Sturdy-This massage table is expertly crafted with a sturdy aluminium frame Comfortable-2" thick high-density foam covered in luxurious PU synthetic leather Portable-Easy to fold and unfold and comes with a free carry case Ideal for professional physical therapists, chiropractors, therapy students, and home users Features -2" High Density Foam Thick Padding with Aluminium Frame Construction -Ultra Soft Advanced Material PU Coated Synthetic Leather Cover -Table Dimensions: 72" Long (without face cradle), 27" Wide -Adjustable Height: 26" to 36", 550lb Capacity -Adjustable and removable face cradle, armrest shelf and side arm extenders -Free Premium Carry Case -Color: Black ★Comes with numerous free accessories:★ The Merax Portable Massage Table comes with free adjustable headrest, free hanging arm shelf, free side arm extenders and premium carry case.